3-Sheet Poster for the first Andy Hardy film, A Family Affair, released in March, 1937. This one is different. It is not a footprinting, but a singular tribute paid to the fictional family from the Andy Hardy series of films. Anybody who is a film buff knows the Andy Hardy movies, and how popular they were. To commemorate that popularity, a bronze plaque, signed by the main cast members and Los Angeles Mayor Fletcher Bowdon, was unveiled. Hanging on the column to the east of the main entrance to the theatre, the plaque hung there for many years, until it was removed during the remodeling for Cinemiracle in 1958. The series began as a play called Skidding by Auriania Rouverol, which enjoyed a modest run of 472 performances on Broadway in the 1928-29 season. Nineteen-year-old actor Charles Eaton played Andy Hardy. 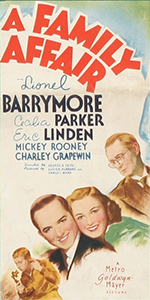 The Metro-Goldwyn-Mayer studio had purchased the screen rights to Skidding, but it wasn't until late in 1936 that it was scheduled to go into production as a fairly routine "B" with Lionel Barrymore in the main role of Judge James Hardy. His wife Emily was played by Spring Byington, while son Andy was played by a rising star named Mickey Rooney. A Family Affair (released in March, 1937), had something about it — theatres all across the country began booking it, and deluging M-G-M with requests for more like it. With audience response like that, it didn't take long for the studio to retool the series, with the next Andy Hardy movie, You're Only Young Once, playing the Chinese by January, 1938. Judge Hardy was now being played by Lewis Stone, mother Emily by Fay Holden, son Andy by Mickey Rooney, and his girlfriend Polly, by Ann Rutherford. The Hardy Family has another connection to Grauman's Chinese. Stone, Holden, Rutherford and Rooney had all participated in a fundraiser, broadcast nationally from the stage of the Chinese, to help Greece fight the Axis Powers. On Staurday, February 8, 1941, the program America Calling: A Salute to the Greek Nation, featured an all-star cast with an orchestra playing songs and arrangements by its conductor, Meredith Willson. The Hardy Family performed a multi-part sketch called "Judge Hardy Family," written by Carey Wilson, who had written for some of the Hardy films. These were heady times, and the Hardy films played their part. Just three weeks after America Calling, Andy Hardy's Private Secretary with Katherine Grayson, played the Chinese in late February, 1941. When the Chinese was given a make-over for the widescreen process Cinemiracle and the film Windjammer, the Hardy Family Plaque was removed in early 1958 — lost forever. M-G-M attempted to revive the series with Andy Hardy Comes Home (released in December, 1958), but it did not catch on. Despite these disappointments, the Hardy Family films continue to spead their sunny charm. Grauman's Chinese Theatre, Hollywood, California. Judge Hardy Family Plaque dedication ceremony, Friday, August 15, 1941. 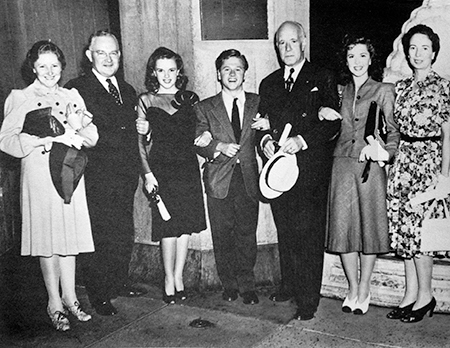 From left to right: Fay Holden, Los Angeles Mayor Fletcher Bowron, Judy Garland, Mickey Rooney, Lewis Stone, Ann Rutherford and Sara Haden.